“Please listen to the teachings having generated the altruistic mind of bodhicitta: the wish to attain full enlightenment for the benefit of all sentient beings. Now we are at the stage of the path. There are two aspects to the path: absolute bodhicitta and relative bodhicitta. Within relative bodhicitta there are the two aspects of bodhicitta of aspiration and bodhicitta of application. Now we will study the aspect of bodhicitta of aspiration. In relation to this, there is what is called the four boundlessnesses: boundless love, boundless compassion, boundless joy, and boundless equanimity. “We will start with love or loving kindness. In this context, we talk about the essence of love, the function of love and the immeasurability of love or the boundlessness of love. What is the essence of love? The essence of love is that type of aspiration or wish that one’s self and all other beings may find happiness and the causes of happiness. However, without the experience of joy or well being, there cannot be an experience of love, and without this there cannot be the action or function of love. Then, also, there is no boundlessness to love. So, we have to start with the experience of well being. We have to feel well being or happiness. We have to experience it in our bodies, in our minds, in our perceptions. As we come close to Buddha nature, there is that sense of well being, of natural happiness, which is not related to an object that produces it. It is not dependent on causes or conditions. It’s not some kind of intoxication. It’s just a very simple sense of well being. 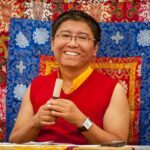 Once we identify it because we have experienced it, we can wish to attain this happiness for ourselves and also for all other beings. “For this basic love, or basic loving kindness to be experienced, we should avoid that which goes against it, and we should try to attain the conditions that may enhance it. So, the conditions that go against this are very much related with feelings or sensations. Within Buddhism we talk about the five aggregates or skandhas. These are the aggregates of form, of feelings or sensation, of evaluation, of impulse, and finally of consciousness. 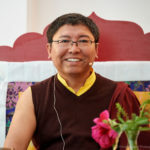 Love is a feeling, and as a feeling is connected with the aggregate of feeling, which according to the Vajrayana system is connected to the subtle body. This subtle body is composed of the tsa, lung, and tigle, the channels, energies, and seeds of energy. Tsa in Tibetan is called nadi in Sanskrit and translates into English as channels. The Tibetan word lung is prana in Sanskrit and translates as energies or winds in English. Tigle is bindu in Sanskrit or “seeds of energy” in English. Within the subtle body there are different levels of subtlety. The channels are kind of gross, the energies are more subtle, and finally the seeds of energy are more subtle again. “According to the Vajrayana, properly functioning tigle (seeds of energy), which are not dried up, are the basis for love, for happiness, for compassion, and for bodhicitta. When the subtle body is in balance, the energy circulates properly through the channels, and the tigle, the seeds of energy, are circulated along with the energy throughout the body. Since the mind rides on these energies, if the tigle are not dried up but circulating throughout the body, the mind has the basis to experience well being and happiness. “Due to our modern lifestyles, our subtle body is usually quite disturbed, as it is very much subjected to situations of hope and fear, which result in some imbalances in the subtle body. Actually, when children are born, if there is no strong karma or no genetic problem, usually they are quite healthy, but as they grow, children become more influenced by the different thoughts and concepts that start to proliferate within their minds. Situations start to happen in which there is lot of hope and fear, particularly fear. Due to this fear the subtle body becomes disturbed. The energies start to circulate when they should not circulate. Sometimes the energies are blocked, sometimes they go in the wrong direction and at a physical or energetic level they start to speed up. “When there is speed or the energies are blocked in many places, the tigle are not spread throughout the body and are not moving with the full sensation of the subtle body. They are stuck in one place and don’t move around. The tigle then start to diminish. When they diminish or dry up, our minds start to feel a sense of depression. Everything is a little bit gray, we’re easily scared. It’s like the opposite of courage and the opposite of bodhicitta. We become chicken-hearted. This is not a completely mental problem; it’s connected to the constitution. As far as I understand, a lot of modern problems are connected to this area. I think depression is somewhere here and unhappiness and anxiety. “What we have to do is to revive the tigle. There are many methods to do this. One is through intellectual conviction. For example, maybe you are feeling a little bit down, but deep down in your mind you trust the Dharma and the blessings of your teacher and the lineage teachers. You still feel a little bit lousy, but your conceptual belief is quite strong. With this you make supplications to the teachers and receive their spiritual influence. These blessings affect the state of your subtle body. The result of this is you start to experience well being. The four empowerments are also connected to this approach. When you feel a lot of trust in your teacher and you receive the empowerments of enlightened body, enlightened speech, enlightened mind, and the wisdom empowerment, this also influences and improves your constitution. Another method is practicing the Six Yogas of Naropa and there are many, many other methods. “The main method we are going to focus on here is the practice of meditation, the state of samadhi. Through practicing shamatha and vipassana, we revive the state of the tigle, and we start to generate the experience of well being or happiness. In the beginning, it’s difficult to address the tigle directly, so we start by working with our minds, which are usually full of thoughts of all kinds. When there are a lot of thoughts that also can dry up the strength of the tigle. Therefore, through the practice of the four applications of mindfulness, we train our minds to calm down and to become more relaxed and to remain still. This automatically rejuvenates the tigle, which results in turn in the experience of well being. “The four mindfulnesses are mindfulness of the body, mindfulness of sensation, mindfulness of the mind, and mindfulness of meditation. Basically, they are four forms of shamatha applied to four different objects: our bodies, our sensations, our mind, and our meditation practice. Of these four, the most important here is mindfulness of the meditation state. Through this our minds find a state of calmness, stillness, and openness, within which that experience of well being, which is the basis of genuine love, starts to happen. However, for mindfulness of the meditation state to be properly developed, we have to depend on the first three. “Mindfulness of the body basically means our minds do not follow thoughts of the past or anticipate thoughts of the future. The mind rests in the present moment without getting involved in all the thoughts of hope and fear related to the present moment. It just rests within the body, with a sense of mind and body being inseparable. It is said that the body rests on the meditation cushion and the mind rests on the body. “Mindfulness of sensations or feelings depends on the energies within the subtle body. When we practice mindfulness of sensations or feelings, we have to somehow deal with those energies. In this case, it’s quite applicable to do a practice called jam lung, which is soft breathing; it’s also a practice of the subtle body. Speed is produced in our constitution at the energetic level. It results in an experience in our minds of worries, anxiety and so forth. Speed itself can go in a positive way or a negative way, but usually it drives our minds in a negative way. This affects our whole system and when this energy comes into the heart, people can become quite depressed. “The practice of jam lung is very simple, there are three aspects: consciousness, the speedy energy, and the breath. First we relax and take a long in-breath. The body rests loose and then in that state we breathe out very slowly and long, and again breathe in very slowly and long. While breathing in that way, the mind is examining where the speed is. We find the points where there is tension and tightness, as that is the speed. The moment the mind notices where speed is, it’s already making a relationship with that speed. We recognize the speed energy and by recognizing it we are uniting with it at the level of consciousness. Then, with the breath we bring it down below the navel. It is very important that there is collaboration between the mind and the speedy energy. Otherwise we might do the whole exercise of bringing the breathing below the navel, but our minds continue to be speedy. In the beginning we need to rely on the breathing, but at some point, once we’ve become quite proficient at this, just by mere attention we can bring down the speed down below the navel. In post meditation it is good to keep about 10% of the energy below the navel. We breathe normally, our minds function normally, and we can get on with whatever we’re doing but about 10% of the energy remains below the navel due to a slight muscle pressure. This helps to keep the energy down and enables us to function well in the world. “The third application of mindfulness is mindfulness of the mind. Our attention is focused directly on the mind: where does it arise from, where does it stay, where does it disappear to. We observe the mind and through mindfulness and knowing bring it to a state of stillness, just by being aware of whatever happens in the mind and recognizing it as such. From that state of stillness, which is the state of shamatha, the fourth application of mindfulness, which is the mindfulness of the meditative state, starts to arise. From there, we can enter the true nature of reality, that state of emptiness which is beyond all kinds of conceptual limitations. This is vipassana. On the basis of the fourth mindfulness, we reach a state of calmness and a natural state of well being starts to arise. “Through the practice of the four mindfulnesses, we become mindful of our body, our feelings and our mental processes. Through these practices we find a state of harmony between the body, the energy, the consciousness, and the feelings. We find there is no more conflict between all these and all our misunderstandings about them are cleared up. We reach a state of calmness and stillness of mind where a natural feeling of well being arises, which is the essence of unconditional love. Once we have found this unconditional love, we have to nurture it and extend it. There is no use finding this and keeping it for ourselves. We have to extend this love. This is the function of love. “Genuine, unconditional love forms the basis for experiencing and developing immeasurable compassion, joy, and equanimity. Though the four immeasurables are explained separately, in our experience they arise interconnectedly. For instance, when we experience this unconditional love, we have a sense of joy and appreciation. At the same time, we realize all other beings have not found this type of unconditional love, and they are still tormented by all types of suffering. 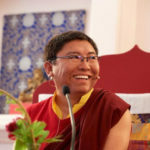 Within our experience the feeling of compassion arises, the feeling of ‘Oh how great it would be if all other beings were free from their suffering and the causes that result in the suffering.’ At the same time we start to experience great joy and also equanimity as we are not making any partial distinctions. As we practice, all four of the immeasurables start to come to one point. The starting point is to first develop and experience that genuine unconditional love. This entry was posted in Living Wisely, Homepage. Bookmark the permalink.